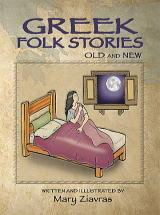 Greek Folk Stories Old and New captures the Greek tradition of oral storytelling reanimating it for modern audiences, providing a unique and fascinating window into a culture that was annihilated. With no wasted words and clever twists in the plots, Mary Ziavras' heartwarming, pithy collection of stories have clever and unexpected twists in the endings. Unlike ancient Greek myths or historic heroes of antiquity, her stories depict the quaint aspirations of ordinary people struggling to overcome obstacles. Her themes are universal and timeless. The book is divided into two sections; retold Folktales of Greece and Asia Minor, and New Stories based on her family's first-hand accounts. They portray the customs and values of Greeks under the rule of the Ottoman Turkish Empire who escaped the Greek/Armenian genocide at the turn of the 20th century. With this book the oral traditions of a people that survived this genocide are not lost. The seven humorous folktales as remembered by Mary's family members from their own childhood, are anecdotes attributed to the 13th century Turkish philosopher Nasreddin Hodja. Can a pot legally reproduce and die? is the question posed in The Borrowed Pot. Mary was greatly influenced by stories such as these that are part of the Greek oral tradition and told to her as a child. She has recreated Hodja's tales, reanimated and embellished them, adding detail and description to the characters and suspense to the plots, to make them refreshingly new and humorous. The thirteen stories from this section are original. 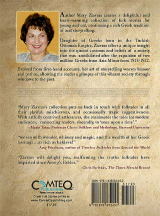 Mary’s art of storytelling incorporates folk-like elements that span a range of human emotions. Woven into the plots are love, trickery, cunning, greed, irony, superstition and humor. She describes concerns about love and marriage, the hereafter, and the importance of avoiding gossip that can ruin a family’s reputation. There is the pervasive theme of the belief in fate and/or in the entities known as The Fates. Her stories evolved from proverbs and parables of the region, and customs and beliefs that have survived the ages. I am grateful to my daughters Julie and Cynthia who heard my stories and encouraged me to write them down. Dorit Lammers, author and leader of the Chelmsford Senior Center writers group first read my stories and inspired me to keep on writing. I am also indebted to members of the Chelmsford Library Workshop who offered supportive criticism and suggestions. I heartily thank them all.